This device was sourced from Nguyen Khuyen Str., and is hand cranked. The roller gap is adjusted by two screws mounted forward of the rollers. 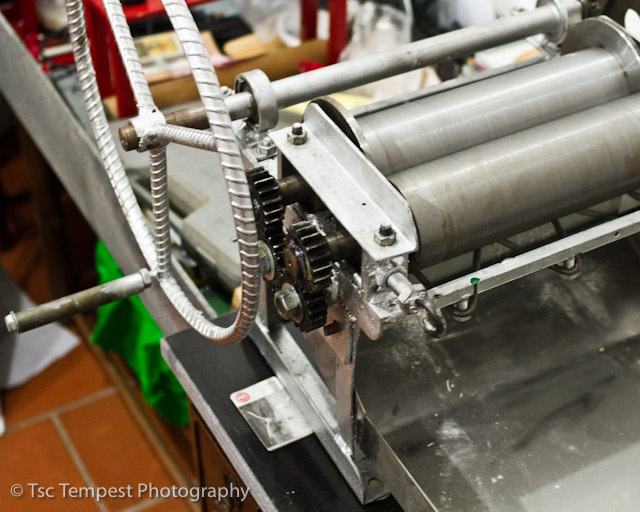 Underneath the rollers are two spring loaded pans that are there to stop the pastry rolling around the rollers, but the current mounting system also tends to catch stick pastry from time to time. The stainless steel catch pan was installed by my favorite sheet metal worker in Hang Thiec Str. With this now in the bakery, We plan to use it for making puff pastry and for finishing pastry shells to the correct, set thickness.